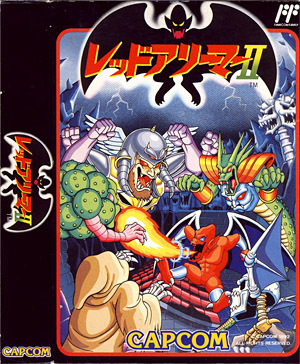 Red Arremer II (aka Gargoyle Quest II) is an action/adventure game by Capcom, and sequel of Red Arremer Makaimura Gaiden originally released for the Game Boy in 1990. 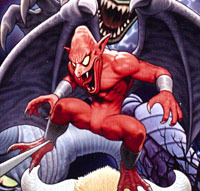 The game follows the story of Firebrand, a young demon from the Ghoul Realm, who studies to become a powerful warrior. One day, while training in his hometown of Etruria, a black light suddenly appears and wrecks havoc on everyone. The king is deadly wounded and Firebrand embarks on a long journey to solve the mystery of the enigmatic light, and find out who is behind the attack. In essence, Red Arremer II is an adventure game with mild RPG elements, punctuated by side-scrolling action phases. The adventure phase is displayed through a traditional overhead perspective, and Firebrand can walk around, talk to other monsters, visit houses, purchase items, save his in-game progress (through a password system) or travel between towns. 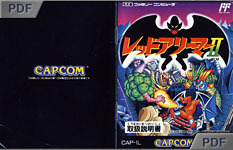 The side-scrolling action phases are periodically activated throughout the game, mainly when Firebrand enters a cave or a dungeon, crosses a bridge or when he encounters rare enemies on the world map. There, he can use his magic powers to defeat all kind of foes - he starts with traditional Fireballs, but more abilities can be collected along the way, such as the powerful arc attack, the platform beam (creates temporary platforms), the Blockbuster (destroys blocks), the claws (to walk over spikes) and so forth. Another of his incredible abilities is to jump and stick to walls, and these techniques are at the core of the gameplay - Firebrand has also the ability to hover in the air for a short amount of time (until his wing level runs out) in order to reach platforms that are otherwise unattainable, or to avoid deadly hazards. Finally, numerous items are scattered throughout the game, such as health, extra lives and Vials (used as currency). Red Arremer is a spin-off trilogy from the highly acclaimed Makaimura series. 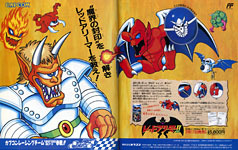 The first episode, Red Arremer Makaimura Gaiden (aka Gargoyle's Quest), was released for the Game Boy system in 1990 (picture on the right/left). 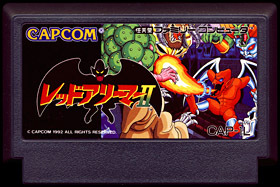 Its sequel, Red Arremer II (version tested here) was released two years later for the Famicom system. This sequel is technically a prequel to the first game, and the events depicted there predate the first episode. It is also really close to the original game but doesn't feature random enemy battles. 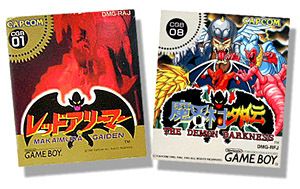 Interestingly, a Game Boy version of the game also exists - Makaimura Gaiden The Demon Darkness was released in 1993 and exclusively in Japan (picture on the right/right). 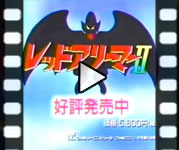 The last episode was Demon's Blazon Makaimura Monshō Hen released for the Super Famicom in 1994. The law of the claw! Before Man ruled the world there were the monsters of Etruria. One such beast - Firebrand the gargoyle, must act to restore the magic that quickly fades from the Ghoul Realm. Join him on his perilous journey as he looks for the origin of a mysterious dark beam of light. Thes epic quest features a hero with leathery wings and the claws of a lion. Breathe fire at hideous creatures that hunger for your essence. Dodge magical assaults, deadly traps and cunning opponents that will stop at nothing to protect their ghastly secret! See if you have what it takes to solve riddles while battling for your very life. Although he was my most hated character from the Makaimura series (thanks to his dead swooping attacks), I've always had an odd fascination for Arremer (aka Firebrand). Despite all the many lives (and coins) he took from me, I have always felt that Arremer was the only enemy in the game with its own distinct personality. Capcom, with the Red Arremer series, gives us an unique insight into what goes behind the scene in the Ghoul Realm, which is frankly genius. Most of Arthur's enemies can be seen in their natural habitats - zombies, mummies, demons and so forth. The game looks superb, everything is finely polished with an incredible attention to detail. The overworld is probably the weakest link, but it plays a minor role and the game mainly focuses on the side-scrolling action scenes, and the change of pace keeps the player continually engaged. My only gripe with Red Arremer II is the difficulty level - well, the Makaimura series is notoriously difficult, controls (especially the flying ability) take some time to get used to, and some stages are painfully frustrating. Everything kills you in this game, even platforms shoot at you! All in all, Red Arremer II is an awesome and fun game, but be aware of its sheer difficulty (not as bad as other early Makaimura games though).